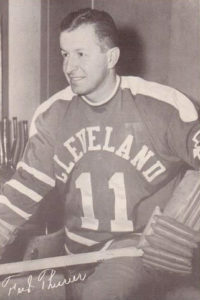 As his career developed Thurier was better known as “Fred.” His was a pro career that began in 1937 and ended in 1952. Along the way, he starred on two Calder Cup championship teams with the AHL’s Cleveland Barons. On those powerhouse squads, he playing with and for some of the greatest to have ever skated here in Providence, including Reds Hall of Famers Johnny Bower, Ab DeMarco and “Bun” Cook. Nicknamed “The Fox”, he led the Barons in scoring in the 1950-51 Calder Cup campaign with 108 regular-season and playoff points. And while he may have been Mount’s original “Flying Frenchman”, hockey’s ORIGINAL came a couple of decades earlier in Canada. That was in 1917 when one of the great early forward lines of the Montreal Canadiens was dubbed “The Flying Frenchmen,” because of their speed and ancestry. The “Flying Frenchmen” nickname reappeared in Woonsocket when the legendary Brother Adelard Beaudet was leading a Mount hockey program comprised primarily of young players recruited from Quebec. Thurier was one of them. Woonsocket had a long history of welcoming families from Quebec to work in its bustling textile mills. In 1890 more than 60 percent of the city’s population was from Canada, and the French-speaking community continued to grow as the textile business prospered. 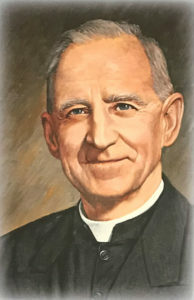 Brother Adelard, himself a Quebec native, realized early on that one sure way to build the Mount hockey program was to recruit young students from Canada to play here. He even used a model from his youth in Quebec to fashion Mount’s uniforms, borrowing the “bleu, blanc e rouge” of the Montreal Canadiens, the team beloved by every young skater in that country. Mount was a power in the late 1920s when just four schools played the sport in R.I., with LaSalle, Central and Classical the opposition. Later, Mount continued to dominate when the R.I. Interscholastic League was formed – the team’s rosters reading like the lineup cards from a Quebec junior hockey league. One season, 10 of the 16 Mount players hailed from Canada. Dubbed by some “The Flying Frenchmen,” the Mount skaters were so dominant that in 1939 all six starters comprised the Journal’s All-State first team. For good measure, another Mount skater was named to the second All-State team, and two more received honorable mention. The 1939 team’s record was 23-1, the only loss a 4-3 squeaker to the Boston College freshmen. Thurier was perhaps Mount’s best during that period. His 50 goals during the 1935 season is a Mount record that still stands today. He led that team to a 26-1 record, with the only loss coming to the Mount alumni, former Flying Frenchmen, by a 2-1 score. He led the Hilltoppers to the RI state, New England and, eventually, the National title. The latter was captured against New Rochelle, NY, before an SRO crowd here at the RI Auditorium. It was to be his last game in a Mount sweater. Two years later he began his 16-year career in the AHL and NHL. As Mount victory totals grew, others schools in the RIIL began to tire of all their losing. 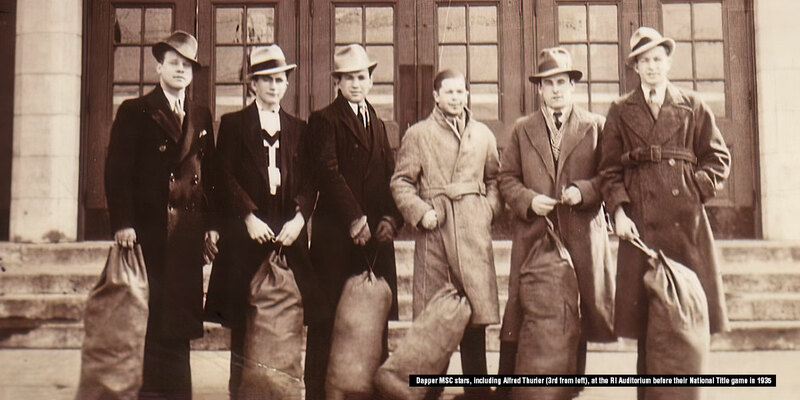 When it was determined that Mount’s star players from up north were boarding students, the league adopted a rule that required boarders to be residents for a full year before becoming eligible to play a sport. That effectively stopped the Canadian imports from playing for the Mount. Later, beyond high school play, Brother Adelard formed an independent amateur team stocked with many young French-Canadians and former MSC alumni, officially naming them “The Woonsocket Flying Frenchmen”. Talented they were, consistently winning against the top college and independent amateur squads throughout the northeast in the early 40’s.